First Appearance: Excalibur (vol. 1) #86 (Feb. 1995): "Back to Life"
Black Air is the British intelligence agency that was the successor to W.H.O. A corrupt faction of Black Air eventually attempted to take over the world, allying themselves with the London branch of the Hellfire Club in order to do so. They used the power of a demon in their bid for world power. Black Air was finally defeated and eventually replaced by the British government by the agency known simply as "The Department." Black Air was based in Blackwall, England. Black Air's members included Michele Scicluna, Scratch, Shrine, and Threadgold. 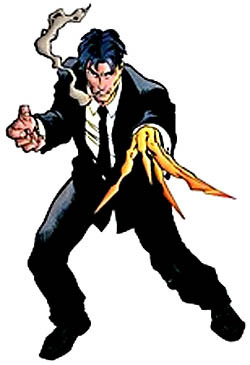 The most famous member of Black Air was Peter Wisdom, a mutant who was also a member of the British super-hero team Excalibur. Excalibur (vol. 1) #86 (Feb. 1995): "Back to Life"
Excalibur (vol. 1) #87 (July 1995): "Back to Reality"
Excalibur (vol. 1) #89 (Sep. 1995): "Easy Tiger"
Excalibur (vol. 1) #90 (Oct. 1995): "Blood Eagle"